About ten years ago, compressed air for paintball guns emerged on the scene. These tanks were generally reserved for serious tournament players as the first compressed air tanks were very expensive compared to carbon dioxide, or CO2 tanks. By nature, a paintball marker requires a propellant to fully function. Traditionally, carbon dioxide was used to achieve these means. No days CO2 has been more or less phased out due to it being more dangerous and expensive to refill. Nowadays players tend to use compressed air paintball guns because it is easier or their equipment. In present day paintball luxuries that were once restricted to professionals are actually reasonable for any player. There’s really no excuse to not use a compressed air tank nowadays for multiple reasons. 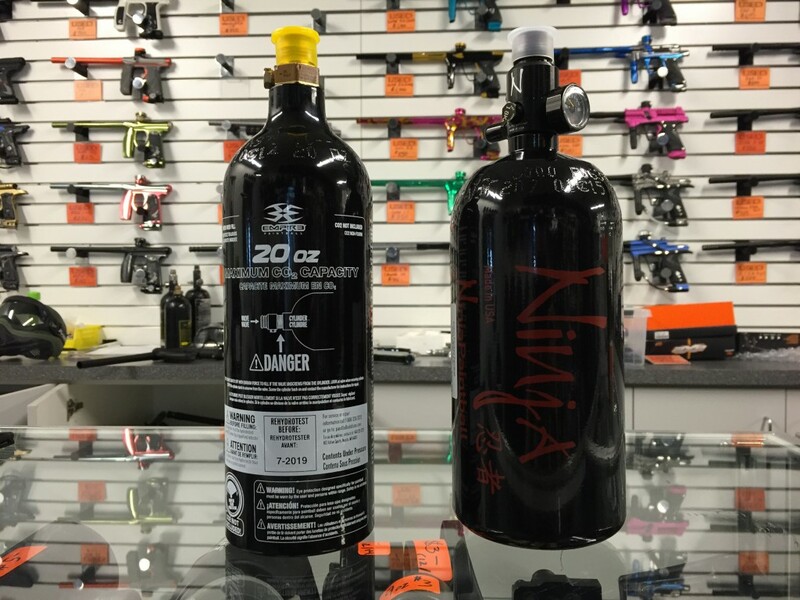 New compressed air tanks are available at our paintball shop for every type of player. Prices range from size, weight and capacity of the compressed air tank. Either way your budget or skill level sways you, obtaining a compressed air paintball tank will certainly further any paintball player’s experience. Using compressed air carries a number of other benefits too. The precision of every individual shot–particularly when firing rapidly–is maintained far better with compressed air. A lesser operating pressure also allows every individual paintball to fly through the air better. A proper fluid propellant through paintball equipment is very important in having an accurate paintball shot. The end result: less untidy ball breaks that clog barrels and compromise precision during the game. Not just is compressed air infinitely far better to store and fill than co2, it greatly enhances the functionality associated with a paintball marker. Compressed air for paintball markers permit operation in a reduced pressure which will come with lots of benefits for efficiency. Tanks both new and used are able to be purchased on-site at our retail shop at any time. Players may refill their tanks at our 3K and 4.5K fill stations during the day with no cost while playing. If your tank is out of date and you want a new one bring your tank in to get a quote on upgrading to a newer generation. Fast-forwarding five years, compressed air is no longer for just the tournament player but actually the preference for players of every level. Compressed air for paintball markers is becoming more and more affordable, cost effective, safer and common ever year. All of these aspects raise the question as to why anyone would use CO2 at all anymore. Not only does lower pressure mean safer but it also helps to improve game play. Looking to play paintball today? Schedule, reserve or walk in and play anytime during the week at Air Assault Paintball. Schedule your next event online or give us a call at 651-222-0300. No group size minimums or time restrictions. Play paintball at the best paintball center in the Twin Cities!